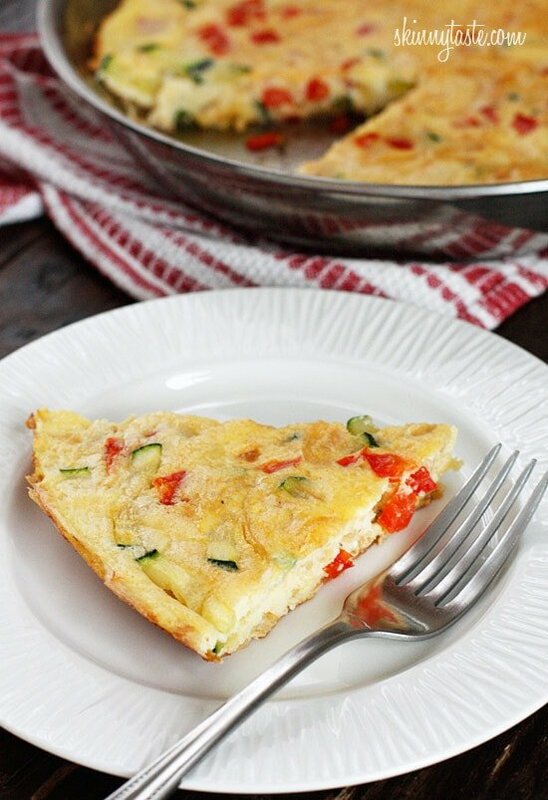 Caramelized onions, sauteed red bell peppers and zucchini combined create a winning egg frittata breakfast dish. More frittata recipes I love are Light Swiss Chard Frittata, Spinach and Feta Frittata and Mushroom Shallot Frittata. Frittatas are very versatile, they can be eaten for breakfast, lunch or dinner if paired with a salad. Cut into small squares, they can be served as an appetizer as well. This starts on the stove and finishes in the oven. I like to use half eggs, half egg whites to lighten my frittatas yet maintain the taste and texture I prefer and keep the vitamins, iron and nutrients, but if you wish to use all egg whites, that would certainly work. Over medium-low heat, heat oil in a 10-inch skillet. Stir in onion and cook until slightly brown, about 10 minutes. 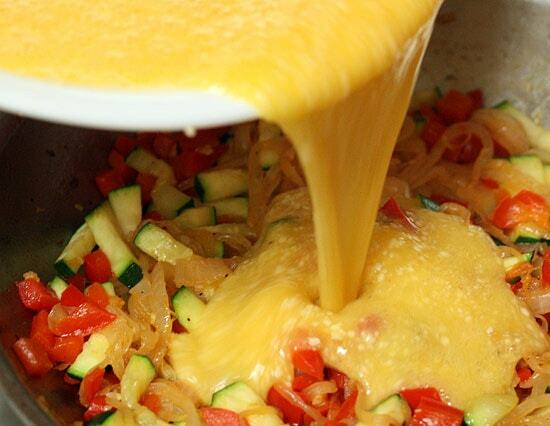 Add peppers and cook 5 more minutes, then add zucchini. Season with salt and pepper and cook 3 more minutes stirring occasionally. In a medium bowl whisk eggs, egg whites, parmesan, salt and pepper. Add eggs to the skillet making sure eggs cover all the vegetables. When the edges begin to set (about 2 minutes) move skillet to oven. Cook about 10-15 minutes, or until frittata is completely cooked. Serve warm, cut into 4 pieces. Note: This has been updated from the archives and slightly modified it to make it even better! I made this last night for breakfasts for the week. It smelled delicious, tasted even better and was easy to make! I passed this recipe on to two colleagues the day after making it! The portions are huge and only 4 pt+!!! Thank you for including the nutritional information. it makes it easy to calculate the points. I will make this again and look at other recipes on your site. I love this recipe….. I’ve made it a bunch of times!!! I’d like to make it for my family as part of our Christmas breakfast so i would like to do it in a 9×13….. what do you suggest? You can double it and bake until it sets at 350. Made this yesterday with fresh produce from a farm! YUM! Can you freeze this and reheat in microwave? I’m looking for an easy breakfast because I leave early in the morning. This was really good!! My daughters both loved it and they are ages 3 and 1. Thank you! Side note, I used 6 whole eggs and baked it in a dish and it turned out great! Can you tell me how the smart points will change if I use low fat cheddar jack cheese. Also, can I add more veggies? This made a very nice dish for brunch today! Didn’t have enough zucchini, so we increased the bell pepper, and added a bit of sliced mushrooms. I just made the fritata this morning. It was very delicious! I was wondering if I could freeze the leftovers to have at a later date. How can I do that? Made this last week. Liked it so much, I made it again this week. I froze individual slices to have for breakfast this week. Yum!! Just made this and loved it thank you!!! Guess what's in my oven right now? You guessed it! I only recently found out I'm NOT allergic to eggs, as I believed my whole life. So I'm starting to experiment. I didn't have any zucchini, so I grated in some broccoli instead. I also threw in a little finely diced fennel bulb, tomato, and added a little basil to the top before throwing it into the oven. I can't wait to try it. I roasted the red pepper instead of using raw red peppers and it was delicious. It added a great sweetness to it. Love this recipe! This recipe is AMAZING! So packed with veggies and so tasty! I've made this many times and love it! I couldn't really taste the parmesan so lately I've been subbing goat cheese for it and I think it's even better! Made this yesterday (w/o parm) and it was delicious! Great recipe & very easy. Is it possible to use all egg whites for this recipe? If so instead of a total of 8 egg whites would I need more? Or could I keep it the same? made it today with just egg whites and used 8 and it was delish!!!! Great recipe! I "used what I had" as far as the veggies and cheese. I only had (gasp) frozen veggies! (onions, peppers, broccoli, carrots) and less than 1/4 cup of parm, but it was still delicious! 1/4 of this recipe is a generous serving IMO. Made this dish for brunch and it was great. Easy to follow instructions and it turned out picture perfect. I did add turkey bacon bits to half of it but it really tasted better without them. Gina, Can you think of another veggie that wouldn't add too much moisture besides red or green bell peppers? (I'm allergic). Thanks. We made this dish this morning and it was great! Nice and fluffy and had a good flavor for a low calorie dish! I have used several of your recipies and they have all been great! Thanks for the wonderful ideas and the pictures help me imagine what the dishes will look and taste like. Thank you! First I have to say I'm a huge fan of your blog. My mom and I have been on Weight Watchers for a little over a year now and I've lost about 70lbs and she's lost about 40lb. We rave about your blog in almost every meeting we go to. Your recipes are a major factor in our success because they keep us excited about the things we eat! I don't think there has been anything we've made from your site that we haven't loved! I just had to comment on this frittata becuase I made it recently as per your instructions and thought it was delicious! The second time I decided to try to make it as mini muffin sized frittatas. I diced all of the veggies so that they would fit nicely in the muffin tin. I still cooked them based on your instructions, except after the zucchini was added in and cooked, I removed the veggies from the heat and allowed them to cool for a few minutes, then I added that mixture into the egg mixture. I poured a 1/4c into each section of the muffin pan (sprayed with some olive oil spray) and then I cooked them at 350 for 25 minutes. It perfectly made a dozen mini frittatas. We each got 3 "muffins" and served with some fruit on the side it was the perfect breakfast! I made this tonight for dinner and the only thing I would comment on is that it was a little bland. I only seasoned with pepper because my husband and I don't cook with salt. I'm sure it would be better with salt, but next time I make it I'm going to season the veggies before I add the egg and cheese. I usually use Italian Seasonings, Garlic Powder, Oregano, and Chili Powder. Overall, it was a great, healthy meal that I will definitely make again! Yummy! I just started WW and this is the first time in 3 days that I've been full! It came out perfect for me, and I followed the directions exactly EXCEPT I just used my food processor for everything, so my zucchini was just in thin discs, not pretty match sticks. I was in a hurry, and it tasted great even without the match sticks! Great recipe! I have made this SO many times, a million different ways, and it has completely revolutionized my cooking repertoire! No longer is soup the only thing I can make at the end of a week with leftover veggies… now we have an amazing frittata, healthy and so tasty (like so many of your recipes! I don't know how you do it, but I'm glad you do! ), it's the perfect dish. Saving this for next month when the zucchini is going wild in the garden. Looks fabulous! Do you think I could use all egg beaters? When I try they never look as good as yours. Tasted great though. Once in a while I will make 'breakfast 4 dinner' for my family. I'm on Weight Watchers and as my children ate chocolate chip pancakes I fully enjoyed this frittata! I substituted the parmesan for goat cheese and used my amazing food processor attachments to matchstick the zucchini…it cut the time down quite a bit. Thank you for having this amazing website…I'd love to know if and when you will have a book!!!! I made this tonight for dinner for a gf…and it turned out amazing! Served it with a light Greek salad and will def make it again!! SO GOOD! We made it tonight and it came out of the pan (All Clad) perfectly. It was so flavorful! Thanks for another great recipe! I made this tonight for dinner and it was delicious! Not too eggy. I love that it was packed full of veggies. I added a little garlic powder to the veggies while they were sauteeing for some added flavor. Can't wait to make this again! Hey Gina! I love all of your recipes, I was wondering if I could make this say on Sunday and have it for breakfast for a few days? Does anyone know if keeps well, how long and if it would be freezable? Thanks in advance! Yum! Swapped out the zucchini for choppedc up lite turkey sausage. I had no idea how easy it was to maje a frittata! Just made this tonight. It was delicious!! I don't have a skillet to oven baking dish so , once the veggies were done, I poured them into the bowl woth the whisked egg and parm cheese, mixed gently and poured it into a pie plate to bake. Sooo good. Just made this for brunch today – used 6 egg beaters & 2 real eggs and sprinkled some goat cheese on the top for the last 5 minutes in the oven. Perfection! Thank you for introducing me to the wonders of the frittata! I made this last night and instead of red peppers because I'm allergic, I used mushrooms. Sadly, I think I may have had the heat on too high on the stovetop befor I put it in the oven, because it was very brown on the bottom. Any suggestions? Thanks, Gina! Keep up the good work! This was just okay on my first attempt. It was kind of bland due to the amount of egg whites, BUT a section that got messed up in the pan as I turned it out was more eggie and yummy. I am not sure what happened because I did whisk the eggs well. I WILL try it again with one less white and one more yolk. I feel like I can get this to work for me. Loved the recipe! Cheated a bit by adding tiny dollops of herbed goat cheese on the top before baking. Thanks for a great one! It looks tasty recipe and I would like to make it on my weekend. 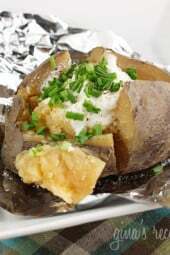 I just pinned this recipe so I could find it easily and try it soon. It looks delicious. can you make with just egg white? and how many if yes? 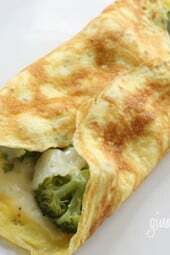 Yes, for every egg use 2 egg whites. I have some yummy recipes that are also healthy on my blog! Check it out! Made this for dinner tonight and it was yummy! Thank you!!! I made this tonight and it was fantastic! I added mushrooms because I had some in the fridge that I wanted to use up. I have many many of your recipes in the past 4 weeks. Your recipes make me excited to cook! Thank you! I make all my frittata similar to you by using 1/3 f the egg yolks. There's enough fat from the remaining yolks for taste and texture, but you are cutting the amount of fat and cholesterol from the eggs in half. I even make regular scrambled and "fried" eggs that way (generally 1 whole egg and 2 egg whites per serving). Beautiful dish! I love making Fritata's, espeically individual ones. Love this recipe!! Doing low carb, this looks great….I always check out your recipes because you always have something I can make and that makes me happy! Gina, what can I substitute for the red pepper? Am I the only one confused on the serving size? LOL. 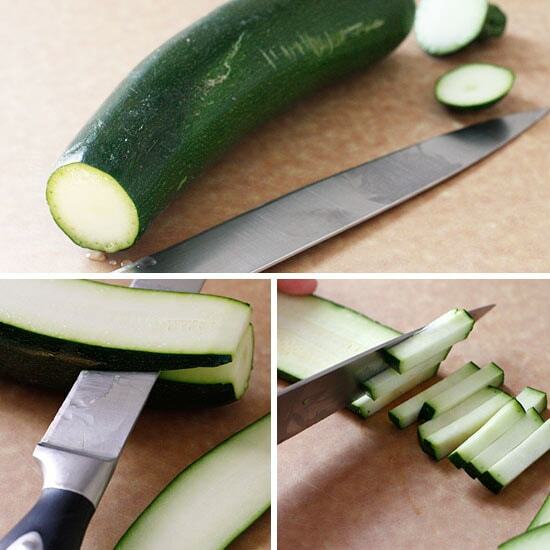 For all of you asking ablout how to cut the zucchini, I added photos to help! Anonymous, if your not a huge fan you can certainly use less. AWESOME! I used a whole onion – overpowering. Next time I will cut back and dice it instead, or use another veggie. This is really great and the calories are fantastic for the volume you get! I listened to a sermon this weekend about how one could find God while cutting a beautiful red onion. 🙂 It was "interesting," but thought provoking nonetheless. So your title in my inbox this morning made me smile. You are using a stainless pan… how did you get it out of the pan??? Lots of spray?? Looks delicious, thanks! No, it didn't stick with the oil I used. This looks great!! I love frittatas! My husband has just discovered, he likes frittata so this is just right for us. Beautiful presentation. Love how easy this is! It sounds awesome. If you don't have a skillet that is oven-safe, is there an alternative way to finish cooking the frittata? Thanks! Sure, cover it and cook it on low heat, then flip it over onto a plate and finish browning on the other side. I don't have an oven proof skillet, either so I cooked the veggies in a skillet then poured the eggs in a round glass pie pan and added the veggies to that..you have to bake just a moment or two longer but it worked great and was so delicious ! With the glass plan about how much longer did you cook it? Same temps?? Wow that looks super awesome. I so wish my husband liked eggs, I think he would love this. I have two questions 🙂 what kind of skillet is best for this? I only have nonstick ones- would these work? 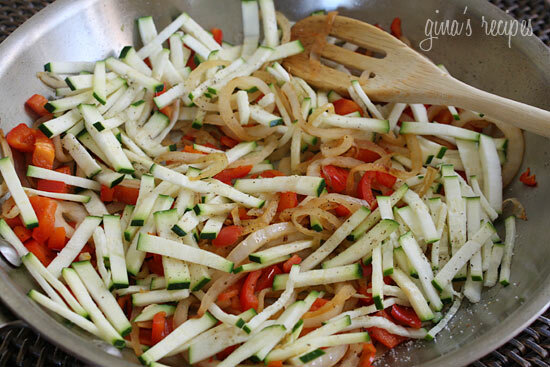 Also, what is the best way to cut the zucchini into matchsticks? Yours look so perfect! 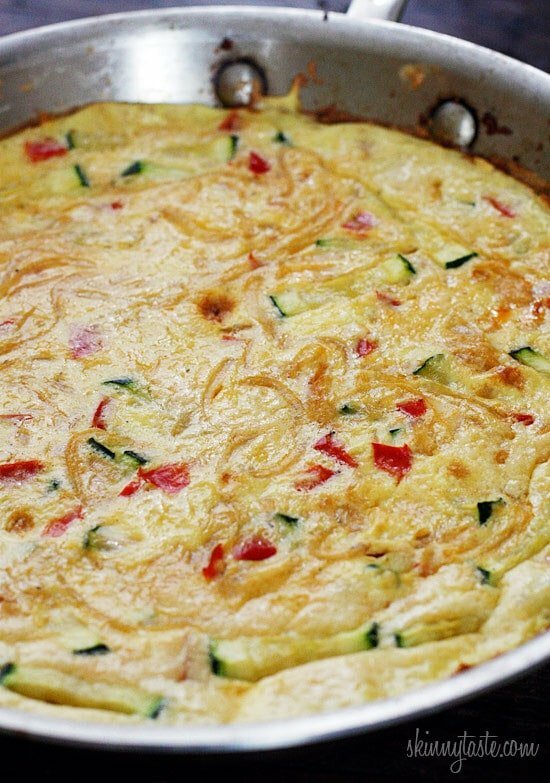 I've never had a frittata, but I have all the ingredients for this one and it looks yummy! An oven safe skillet that can withstand the heat. If you don't own one, you could cover it on low and let it cook in the pan, and flip it to brown the other side once it is set. The oven is easier IMO. Yes, red bell pepper. Sorry for the confusion. I think this is 4 points on the new ww system? Made this last night and it was delicious. Easy to prepare and filling for the calories! I have this in the oven right now! Thank you for all the wonderful recipes! This looks good, tasty and healthy to boot! That looks wonderful! Adding it to my to-do list. yumyumyum, delicious my friend. You surprise me every time with new amazing recipes! This looks so delicious and also you make it look very easy. Will definately be trying this. 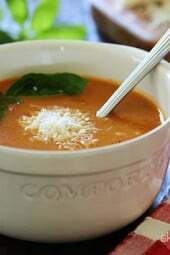 I love all of your recipes and I have been reading your blog for a little while now. Keep up the great work!